That's our experience in Lijiang in a nutshell. We arrived here a bit tired (it's a nine hour bus ride from Kunming) but still fairly rested given we'd just been on our best bus ride of the trip. Our seats resembled barcaloungers and over the nine hours there was zero karaoke. Woo, and may I say, hoo. The new town of Lijiang itself isn't a whole lot to look at; the main appeal is the old town. So after reluctantly getting off the Chinese equivalent of the Madden Cruiser, we headed towards old town. The old town is cobblestone streets and old stone houses that give the feel that you've been transported back hundreds of years. Our first 10 minutes wandering through it had us wondering whether we'd again successfully avoided the tourist season; all the closed up shops and mostly empty guesthouses make us think we'd hit another ghost town. Then we turned a corner and entered the old market square. Good freakin' lord. At 6pm on a Saturday night it could only be described as chaos: Chinese tour groups flying around, Naxi (the local minority) women selling various trinkets, more westerners than we'd seen in weeks and a two horse camera op complete with an Attila the Hun looking tout. We definitely weren't in Kansas any more. In fact a Irishman we ran into described it best when he stated "Did I just enter a theme park? I thought I'd have to buy a ticket to get into old town". There is no doubt that Lijiang is definitely a tourist destination (some would say tourist hell). You can't walk through the main streets without using NFL running back-level dodging and weaving around all the tour groups (and you're still going to end up getting elbows in your ribs, shoulders in your back and your feet stepped on). We saw hordes of Chinese tour groups still being led around at 10pm, which has to be some kind of record. At night a couple of the more famous restaurant alleys felt more like Fraternity Row during pledge week, with people drunkenly hanging out of windows singing and the costumed workers all chanting trying to outdo each other to bring you in to their restaurant. Yuk, ick, and ugh. Get me out of here. However like many tourist destinations, it has become that for a good reason. Old town is a picturesque blend of cherry blossoms, canals, stone bridges, and chinese lanterns. The endless maze of streets provide a charming place to lose yourself in for hours. And you CAN get away from the crowds; all it takes is a minimal effort to get out of the main streets and you're home free, wandering along the local homes and in our case, spending two hours trying to find this amazing restaurant we'd been to the night before. The Petit Lijiang Bookcafe is restaurant/bookshop/jazz wine bar/travel agency run by a Belgian gentlemen and his Chinese wife. We happened upon it while "getting lost" in the back streets of Lijiang and stopped when Becca spotted a 5 year old version of Lonely Planet New Zealand on the shelf. (big deal you say? it is when you're unable to find a copy anywhere and need to figure out where you're going next...). We started by ordering drinks and got sucked in by the peaceful ambiance, friendly conversation and fantastic jazz and ordered dinner. Short of one or two meals in Beijing it was the best Chinese food we'd had on the trip. A must go place while in Lijiang; at the very least for a glass of wine and the best hash browns I've had since home. 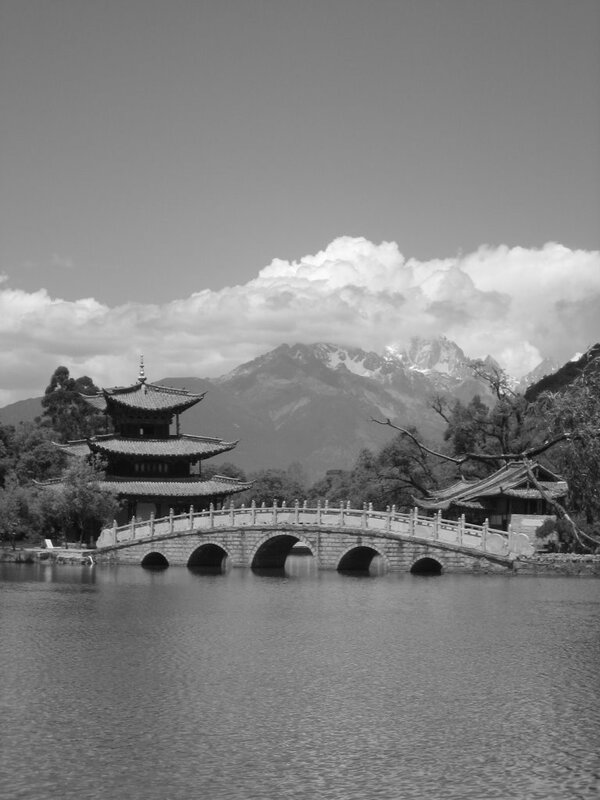 My favorite place here in Lijiang though has to be the Black Dragon Pool Park. With its picture-perfect views of Jade Dragon Snow Mountain, endless willow trees hanging over the water, flower-lined paths and numerous hidden grassy slopes to lay down on, it was the perfect place to relax. For one of the few times on our trip, we had that lazy Sunday afternoon we've sought and desired so much. Instead of feeling the need to do another "tourist must-see" or work on planning for New Zealand, we spent the day reading in the park and in my case napping and watching the clouds pass by overhead. Can't think of a more fitting way to enjoy Lijiang. The topper? While old town was jammed with people, the park (a 10 minute walk away) was nearly empty. 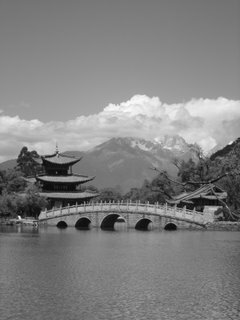 So in all, Lijiang (once we figured out how to escape the tourist chaos) has far exceeded our expectations. This is the first place in China we've seen with an actual nightlife (things were all still hopping when us two sticks in the mud headed for home at 10:30) and it has a little bit of something for everyone. It's a place where you can find madness and serenity all in a tightly bound package.